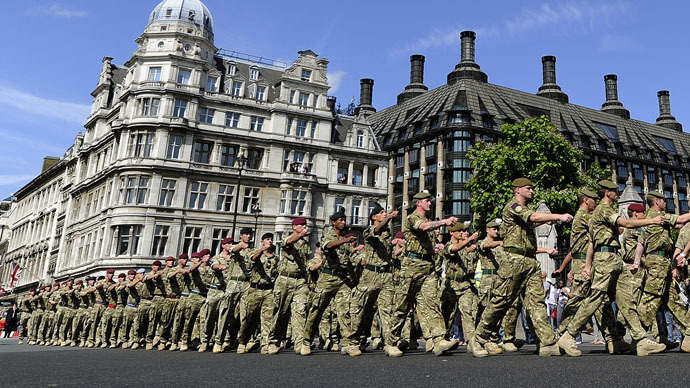 The UK Independence Party (UKIP) has pledged to increase the defense budget and hit NATO spending targets while promising service personnel “more funds, more respect and more support” in a new campaign poster. UKIP is using the poster, which features a desperate looking soldier holding an upturned helmet as a begging bowl, to urge the government to meet the symbolic 2 percent of GDP spending stipulated by NATO rules for its member states. A central strand of the populist right-wing party’s policy is honoring the Military Covenant – a theoretical obligation to extend certain guarantees of care to those who forgo particular rights by enlisting in the military. On the policy page of its website, UKIP promise proper resourcing and pledge a number of favorable benefits for current and former personnel. The party also promises to prioritize housing for veterans, to found a US-style “Veterans Department” to provide after-service care, an ex-Forces identity card to fast-track health care and a national medal for service. The poster’s target audience is said to be traditional Conservative voters who view the armed forces particularly favorably and object to defense cuts. Its release comes only a day after Prime Minister David Cameron urged those Tories tempted by UKIP to return to the fold. The UK’s willingness and ability to meet the NATO requirement is also a topic of concern for Britain’s international partners. The most recent US figure to air his views on the UK’s defense policy is former US ambassador to the United Nations John Bolton. Speaking to the Telegraph newspaper, Bolton said: “A diminished UK military strength also has a more profound effect internationally because it is a sign to our mutual enemies that there is a diminished will in the West to defend itself. It sends an extremely negative signal to our enemies.